Here, we describe the ex vivo expansion of hematopoietic stem cells from CD34+ cells derived from umbilical cord blood treated with a combination of a cytokine cocktail and VPA. This method leads to a significant degree of ex vivo expansion of primitive HSCs for either clinical or laboratory applications. Papa, L., Djedaini, M., Hoffman, R. Ex Vivo Expansion of Hematopoietic Stem Cells from Human Umbilical Cord Blood-derived CD34+ Cells Using Valproic Acid. J. Vis. Exp. (146), e59532, doi:10.3791/59532 (2019). Umbilical cord blood (UCB) units provide an alternative source of human hematopoietic stem cells (HSCs) for patients who require allogeneic bone marrow transplantation. While UCB has several unique advantages, the limited numbers of HSCs within each UCB unit limits their use in regenerative medicine and HSC transplantation in adults. Efficient expansion of functional human HSCs can be achieved by ex vivo culturing of CD34+ cells isolated from UCBs and treated with a deacetylase inhibitor, valproic acid (VPA). The protocol detailed here describes the culture conditions and methodology to rapidly isolate CD34+ cells and expand to a high degree a pool of primitive HSCs. The expanded HSCs are capable of establishing both short-term and long-term engraftment and are able to give rise to all types of differentiated hematopoietic cells. This method also holds potential for clinical application in autologous HSC gene therapy and provides an attractive approach to overcome the loss of functional HSCs associated with gene editing. Ex vivo expansion of hematopoietic stem cells (HSCs) from umbilical cord blood (UCB) units holds great promise for HSC applications in regenerative medicine and transplantation therapy. Transplantation with UCB units has several unique advantages such as easy collection, high availability, minimal risk of infection, low risk of disease relapse, and low frequency of graft-versus host disease (GVHD). However, the major disadvantages of their use in clinical settings are the limited number of HSCs present within each UCB unit1. The insufficient number of HSCs results in delayed engraftment and hematopoietic recovery, risk of graft rejection, and aberrant immune reconstitution. Currently, various methods and strategies have been developed to ex vivo expand the limited number of HSCs from UCBs. Combinations of different cytokine cocktails with small molecules or compounds in ex vivo cultures result in various degrees of expansion in HSC numbers2,3,4,5,6,7,8. Importantly, ex vivo culture conditions induce stress, leading to rapid cell proliferation, increased metabolic activity and loss of the primitive characteristics that define primary HSCs. Therefore, developing protocols that lead to expansion of a great number of functional HSCs with characteristics that closely resemble primary primitive HSCs are needed. Serum-free cultures of CD34+ cells isolated from UCBs and treated with valproic acid (VPA) result in the expansion of large numbers of primitive HSCs4,9,10. The HSC expansion is not solely due to the proliferation of the existing HSCs derived from UCBs. Instead, this expansion is due to the acquisition of a primitive phenotype combined with a limited number of cell divisions and proliferation9. 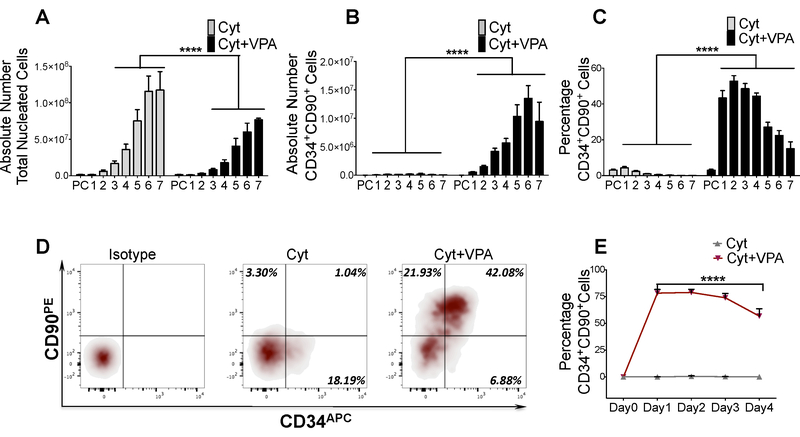 Within the initial 24–48 h of incubation with a combination of cytokines and VPA, CD34+ cells acquire a transcriptomic and phenotypic profile that characterize long-term HSCs. The significant increase in the percentage of HSCs is accompanied by a prompt increase in the number of HSCs (63 fold increase within 24 h of VPA treatment)9. Notably, the VPA-ex vivo expansion strategy expands HSCs with low metabolic activity, which further highlights their primitive characteristics. The method described here provides conditions and treatments that lead to a significant degree of ex vivo expansion of primitive HSCs for either clinical or laboratory applications. This ex vivo expansion strategy uses a cytokine cocktail combined with VPA treatment. VPA is an FDA approved drug for treatment of bipolar disorders and other neurological diseases. The HSC expansion with VPA is prompt and occurs within 7 days, minimizing both the time of manipulation and the risk of contamination. Importantly, this protocol allows for the acquisition of long-term HSC phenotypic markers such as CD90 and CD49f within 24-48 h following treatment with VPA9. Expanded HSC grafts created with this protocol have the capacity to regenerate the hematopoietic system since they can differentiate into all hematopoietic cell lineages and establish long-term engraftment following transplantation into myeloablated NSG mice models4. Moreover, this protocol is highly reproducible and allows for efficient and rapid isolation of viable CD34+ cells from UCBs, which is critical for industrialization of this procedure. The VPA ex vivo expansion protocol also has the potential to overcome the significant loss of HSCs which occurs during gene editing11. Gene editing requires exposure to cytokines, which are necessary for cycling cells and activation of DNA-repair mechanisms. Due to the prompt effects of VPA treatment, this method might be beneficial for the generation of a higher number of genetically modified cells within a period of time that is relevant for currently utilized gene modification protocols. The HSC ex vivo expansion protocol follows the guidelines of the Research Ethics Committee at Mount Sinai School of Medicine. Prepare separation buffer 24 h prior to isolation of CD34+ cells from UBCs by adding 2 mL of 0.5 M Ethylene Diamine Tetra-acetic Acid (EDTA) and 33 mL of 7.5% Bovine Serum Albumin (BSA) to 465 mL buffered saline (1x PBS). Mix gently and maintain the buffer overnight at 4 °C. Warm media at room temperature on the day of purification. Dispense the whole UCB unit into a 75 cm2 flask. Dilute and gently mix the UCB with an equal volume of PBS at room temperature. Determine the number of tubes required for processing the whole UCB unit (one 50 mL conical tube can be used to process 35 mL of diluted UCB). Add 15 mL of density gradient media (see Table of Materials) to each tube and dispense the diluted UCB on the top of the density gradient media creating two layers. NOTE: Dispense the diluted UCB very slowly while holding the tube at a 45° angle to prevent mixing of the density gradient media layer with the UCB. Centrifuge at 400 x g for 30 min at a low acceleration and deceleration rate. After centrifugation, MNCs locate in the white layer (buffy coat) between the plasma and density gradient media layer. Slowly aspirate 2/3 of the plasma without disturbing the buffy coat layer. Carefully transfer the buffy coat layer into a new 50 mL tube. Collect all MNCs from the same UCB unit into a 50 mL tube until reaching 25 mL. Use a new tube if the volume of collected MNCs exceeds 25 mL. Add 25 mL of cold PBS into the tube containing 25 mL of MNCs and mix well. Centrifuge at 400 x g for 10 min at 4 °C. NOTE: Cold PBS is important to prevent capping of antibodies on the cell surface and reduce non-specific labeling. Carefully aspirate the supernatant and gently re-suspend the cell pellet in 50 mL of cold PBS. Remove 20 μL of the cell suspension for counting. Count the cell number stained with acridine orange/propidium iodide staining by using an automated cell counter. Calculate the total number of MNCs. NOTE: The cell count can be also performed by the trypan blue exclusion method using a hemocytometer. Centrifuge at 400 x g for 15 min at 4 °C. NOTE: If not required immediately, MNCs can be frozen at this stage. Prepare the CD34+ antibody coupled with magnetic beads solution for isolation of CD34+ cells from MNCs. Mix 300 µL of separation buffer with 100 µL of human FcR human IgG (blocking reagent) and 100 µL of CD34 magnetic beads for isolation of CD34+ cells from each 108 MNCs. For isolation of a higher number of CD34+ cells from (>108) MNCs, scale up reagents accordingly. Carefully aspirate the supernatant from the tube centrifuged at step 2.8. Resuspend the pellet in the CD34 magnetic beads solution prepared in step 3.1 (use 500 µL of solution per 108 cells). Mix gently and incubate at 4 °C for 30 min. NOTE: Prepare the cell separator device (see Table of Materials) during the incubation period. Replace the storage solution with the working buffer as indicated by the manufacturer’s instructions and run a washing program followed by a rinsing program. Add cold cell separator running buffer to the tube containing the cell mixture until the tube is fully filled. Centrifuge at 400 x g for 15 min at 4 °C. Aspirate the supernatant and resuspend the cell pellet in cold cell separator running buffer (2 mL/108 cells). Transfer the 2 mL of cell suspension mixture into 15 mL tubes. Load 3 sets of 15 mL tubes into the cell separator rack prechilled at 4 °C. One set of tubes contains MNCs, the second set of tubes will be used to collect the negative fraction and the third set of tubes will be used to collect purified CD34+ cells. Load the rack into the cell separator device and run the posseld2 preset program. NOTE: An alternative method that utilizes manual magnetic separator can be used to replace the cell separator device12 . Centrifuge tubes with the positive fraction at 400 x g for 15 min at 4 °C. Aspirate the supernatant and resuspend purified CD34+ cells in 1 mL of serum-free media. Count the cells stained with acridine orange/propidium iodide using an automated cell counter. NOTE: If not required immediately, purified CD34+ cells can be frozen at this stage. Prepare sufficient volume of media to plate the purified CD34+ cells at a density of 3.3 x 104 cells/mL. The culture media composition is serum Free culture medium (see Table of Materials) supplemented with 10 µL/mL pen/strep, 150 ng/mL stem cell factor (SCF), 100 ng/mL fms-like tyrosine kinase receptor 3 (FLT3 ligand), 100 ng/mL thrombopoietin (TPO), and 50 ng/mL interleukin 3 (IL-3). Plate purified CD34+ cells in a 12-well plate (5 x 104 CD34+ cells/ 1.5 mL of media/ well) and culture at 37 °C in a 5% CO2 humidified incubator. Assess the purity of isolated CD34+ cells and cell composition by FACS analysis as described below in step 6.3. Add VPA at a final concentration of 1 mM into the cultures of cells treated for 16 h with cytokine cocktail. Culture the cells for an additional 7 days at 37 °C in a 5% CO2 humidified incubator. NOTE: Media remains unchanged during the duration of the ex vivo expansion. Prepare antibody-staining solution to stain 2 x 104–6 x 104 cells and isotype solution to determine FACS gating strategy and determine the level of non-specific binding. Dilute antibodies (1/100 APC anti-CD34, 1/200 FITC anti-CD90) and the respective isotypes into 50 µL of separation buffer (composition of separation buffer is defined in step 1.1). NOTE: Perform single staining of cells with each antibody for a FMO gating strategy. Total antibody compensation bead kit (see Table of Materials) can be used for compensation setup. Homogenize the cell culture by pipetting multiple times. Count cells and pipet 5 x 104 cells into a 1.5 mL tube. Add 1 mL of separation buffer and centrifuge at 400 x g for 15 min at room temperature. Aspirate the supernatant and resuspend the pellet in 50 µL of the staining solution. Incubate cells for 30 min at room temperature. Add 450 µL of separation buffer and centrifuge at 400 x g for 15 min at room temperature. Aspirate the supernatant and resuspend the pellet in 100 µL of separation buffer. Keep cells on ice for at least 5 min until performing FACS analysis. Add 1 µL of 7-AAD to gate viable cells. Load the stained cell sample on the FACS machine and acquire cells at the lowest flow rate. For each fluorophore, analyze the isotype controls and single stained cells to set up gating for FITC (CD90), APC (CD34), and PerCP/Cy5.5 (7-AAD) staining. Gate PerCP/Cy5.5 negative fraction and plot APC vs FITC to determine the percent of viable CD34+, CD90+, and CD34+CD90+ cells that defines the HSPC/HSC population in the culture. Resuspend the expanded cells by pipetting multiple times. Count the cell number and transfer the whole culture into a 15 mL or 50 mL tube. Prepare antibody-staining solution to stain 5 x 105­–2 x 106 cells and isotype solution to stain 1 x 105 cells and determine FACS gating. Dilute 1/10 (APC anti-CD34), 1/20 (FITC-CD90) antibodies and the corresponding isotypes into 500 µL of separation buffer per each condition. Prepare the single color compensation controls using a total antibody compensation bead kit according to manufacturer's instructions. Transfer the supernatant from step 5.2 into a new tube and keep it at 37 °C. This culture media will be reused to culture the sorted cells. Resuspend the cell pellet in cold separation buffer to obtain a concentration of 5 x 105 cells/ mL. Transfer 1 x 105 cells in 1.5 mL tubes for isotype staining and the remaining cells that will be sorted into other 1.5 mL tubes. Centrifuge the tubes at 400 x g for 15 min at 4 °C. Discard the supernatant and resuspend pellets of cells in isotype staining solution and the pellet of cells that will be sorted in the antibody staining solution. Add 450 µL of separation buffer and centrifuge at 400 x g for 15 min at 4 °C. Resuspend the pellets with 2 mL of cold separation buffer. To prevent clogs, filter the samples through a 40 μm cell strainer and place on ice until FACS. Set-up cell sorter for sorting with the correct parameters. Run isotype samples to set voltage and gain for forward and side scatter and identify negative fluorescence populations. Run single color controls to set compensation coefficients and apply compensated parameter to collection protocol. Run a small aliquot of the (Ab) sample (~50,000 events) to establish the gating strategy. Set up sort decisions to collect the CD34+ CD90- cell fraction. Sort cells into collection tubes coated with 2 mL separation buffer. After sorting, recount the cells and centrifuge them at 400 x g for 15 min at 4 °C. Discard the supernatant and resuspend the pellet in the media recovered in step 5.5 to reach a final concentration of 3 x 104 cells/mL. Plate CD34+ CD90- purified cells in 12-well plates with 1.5 mL medium/well (5 x 104 CD34+ CD90- cells/1.5 mL of media/well). Assess the purity by FACS analysis using 50 µL of media containing cells. 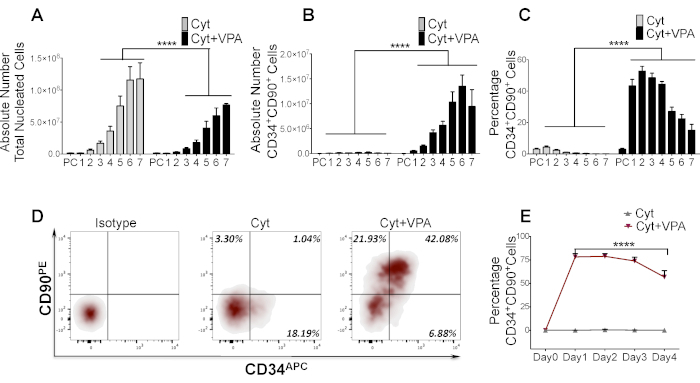 Treat the cultures of CD34+CD90- cells with VPA at 1mM final concentration. Incubate at 37 °C in a 5% CO2 humidified incubator. The ex vivo protocol described here increases the number of primitive HSCs generated from CD34+ cells isolated from UCBs (Figure 1). Priming of CD34+ cells for 16 h with a cytokine cocktail, followed by treatment with VPA for an additional 7 days, leads to a great degree of HSC expansion. Remarkably, the pool of expanded cells is highly enriched for HSCs, which are phenotypically defined by CD34+CD90+ markers. The total number of nucleated cells (TNCs) in cultures treated with the cytokine cocktail alone is significantly higher than the numbers of cells observed in cultures treated with the cytokine cocktail and VPA (Figure 2A). Despite the higher number of TNCs, the number of HSCs in the cultures receiving the cytokine cocktail alone remains low during the entire expansion period compared to cultures treated with the cytokine cocktail and VPA (Figure 2B). The greatest number of HSCs is generated in cultures treated with a combination of the cytokine cocktail and VPA (Figure 2B). In particular, the greatest expansion in the numbers of HSCs is reached after 5–7 days following VPA treatment (Figure 2B). The increased number of HSCs correlates with a prompt increase in the percentage of HSCs, which is notable within 24 h of VPA treatment (Figure 2C). While the increase in the percentage of HSCs is high and maintained during the first 4 days of ex vivo culture, it declines progressively after 5–7 days of treatment with VPA (Figure 2C). However, this decrease is inversely correlated with an increase in the absolute number of HSCs. Importantly, the rapid increase in the percentage of HSCs observed in VPA treated cultures is due to the acquisition of the CD90 phenotype. CD34+ cells expressing the CD90 phenotypic marker reaches almost 40%–45% of cells expanded in ex vivo cultures treated with the cytokine cocktail and VPA for 4 days (Figure 2C,D). The acquisition of the CD90 phenotype is further confirmed by ex vivo expansion of the highly purified CD34+ cells that lack expression of the CD90 marker. Within 24 h of VPA treatment, almost 75% of the ex vivo expanded cells in cultures initiated with sorted CD34+CD90- cells express CD90 as opposed to 0% of the cells in cultures containing the cytokine cocktail alone (Figure 2E). Importantly, the CD90 phenotype is highly retained during the first 4 days in ex vivo cultures treated with VPA (Figure 2E). Figure 1: Schematic presentation of ex vivo expansion culture. Purified CD34+ cells from UCBs are primed for 16 h in ex vivo culture supplemented with a combination of the indicated cytokines. Cultures are treated with VPA (1mM) for an additional 7 days. The ex vivo expanded cells may then be transplanted into myoablated NSG mice. Please click here to view a larger version of this figure. Figure 2: VPA treatment triggers the acquisition of CD90 resulting in the expansion of a great number of HSCs. (A) Absolute number of total viable nucleated cells expanded in ex vivo cultures9. Purified CD34+ cells from UCBs described in section 3 treated with cytokine cocktail alone or a combination of cytokine cocktail and VPA as described in section 4 were counted by acridine orange/propidium iodide staining (n = 16). Numbers denote days of treatment with VPA, whereas PC denotes the primary uncultured CD34+ cells isolated from UCBs. (B, C) Absolute number and percentage of CD34+CD90+ cells expanded throughout 7 days in ex vivo cultures treated with cytokine cocktail alone or a combination of cytokine cocktail and VPA (n = 21). Percentage of CD34+CD90+ cells is determined by flow cytometry analysis of cells stained as described in section 4. (D) Phenotypic analysis of sorted CD34+ cells from UCBs (step 5.3) expanded in ex vivo cultures treated as indicated for 4 days. Left panel indicates the gating strategy using isotype staining whereas the other panels indicate stained cells expanded in cultures containing cytokine cocktail alone or a combination of cytokine cocktail with VPA. Numbers denote the percentage of CD34-CD90+ cells, CD34+CD90- cells and CD34+CD90+ cells. (E) Percentage of CD34+CD90+ cells expanded in cultures initiated with sorted CD34+CD90- cells from UBCs and treated with cytokine cocktail alone or a combination of cytokine cocktail and VPA for the indicated days. Percentage is determined by flow cytometry analysis (n = 4). N: number of biological replicates. Error bars with SEM; ****p ≤ 0.0001 as determined by negative-binomial models for A and B, Beta models for D and 2-way ANOVA for panel E. Panels A–C and E have been modified from Papa et al.9 Please click here to view a larger version of this figure. Herein, we present a protocol to rapidly expand to a significant degree the number of functional human HSCs from UCBs. The pilot and kinetic studies using this protocol indicate that the ex vivo expanded cells promptly acquire and retain the expression of several HSC phenotypic markers including CD90 as well as primitive HSC metabolic characteristics9. This ex vivo expansion protocol is relatively simple and reliable. Purification of CD34+ cells with the cell separator device (see Table of Materials) is highly reproducible and rapid, allowing for fast recovery of isolated cells. This method results in a high yield of purified CD34+ cells (>90%) as opposed to manual immunomagnetic separation. Moreover, this ex vivo expansion protocol does not require special and complex devices or fed-batch culture systems that need continuous supplies of large volumes of fresh media supplemented with cytokines3,13. Accordingly, this method limits costs. Importantly, this protocol allows for the expansion of the HSC pool within a short time, which is a key limiting factor for contamination frequency. Several points should be considered for achieving primitive HSCs from CD34+ cells using this protocol. CD34+ cells expanded for 4 days in cultures treated with the cytokine cocktail and VPA lead to the generation of a pool of primitive long-term HSCs. These HSCs are characterized not only by the high expression levels of CD34, CD90 and CD49f, but also by a very primitive metabolic profile, which predominantly relies on glycolysis9. During more prolonged incubation with VPA for 7 days, expanded cultures however are more heterogeneous and contain a greater number of both long-term and short-term as well as differentiated cells as opposed to cells expanded for 4 days. This outcome is mainly due to the exhaustion of VPA in culture and increased number of cell divisions9. Thus, this protocol can be used to achieve expansion of two different pools of cells: 4-day and 7-day expanded cells. The 7-day expansion product can be used for allogeneic HSC transplantation where more rapid as well as sustained multilineage engraftment is required. The 4-day expansion protocol might be best suited for genetic modification strategies that target long-term repopulation cells. It is also likely that this combination of VPA and cytokine cocktail can expand the pool of HSCs from CD34+ cells at the same degree or higher when using media other than the media (see Table of Materials) used in this protocol. Current gene editing procedures are associated with a significant loss of HSCs, which limit their clinical application. The great number of primitive HSCs achieved within 2–4 days of VPA treatment in ex vivo cultures has the potential to overcome this loss in HSC numbers. Thus, this protocol might be beneficial for improving the existing gene editing protocols and enable correction of genetic mutations in HSC transplantation-based therapies for β-thalassemia and sickle cell disease. Moreover, it can be applied to maintain great numbers of HSCs during gene manipulations for studies focused on the elucidation of gene functions in HSCs and in hematopoiesis. In conclusion, the method described here can be used for ex vivo expansion of both human and murine HSCs and can be tailored to specific clinical applications as well as to a wide spectrum of investigations in basic research. Broxmeyer, H. E. Enhancing the efficacy of engraftment of cord blood for hematopoietic cell transplantation. Transfusion and Apheresis Science. 54, (3), 364-372 (2016). Boitano, A. E., et al. Aryl hydrocarbon receptor antagonists promote the expansion of human hematopoietic stem cells. Science. 329, (5997), 1345-1348 (2010). Fares, I., et al. Cord blood expansion. Pyrimidoindole derivatives are agonists of human hematopoietic stem cell self-renewal. Science. 345, (6203), 1509-1512 (2014). Chaurasia, P., Gajzer, D. C., Schaniel, C., D'Souza, S., Hoffman, R. Epigenetic reprogramming induces the expansion of cord blood stem cells. Journal of Clinical Investigation. 124, (6), 2378-2395 (2014). Wagner, J. E. Jr, et al. Phase I/II Trial of StemRegenin-1 Expanded Umbilical Cord Blood Hematopoietic Stem Cells Supports Testing as a Stand-Alone Graft. Cell Stem Cell. 18, (1), 144-155 (2016). Peled, T., et al. Nicotinamide, a SIRT1 inhibitor, inhibits differentiation and facilitates expansion of hematopoietic progenitor cells with enhanced bone marrow homing and engraftment. Experimental Hematology. 40, (4), 342-355.e1 (2012). Nikiforow, S., Ritz, J. Dramatic Expansion of HSCs: New Possibilities for HSC Transplants? Cell Stem Cell. 18, (1), 10-12 (2016). Mehta, R. S., et al. Novel Techniques for Ex vivo Expansion of Cord Blood: Clinical Trials. Frontiers in Medicine. 2, 89 (2015). Papa, L., et al. Ex vivo human HSC expansion requires coordination of cellular reprogramming with mitochondrial remodeling and p53 activation. Blood Advances. 2, (20), 2766-2779 (2018). Papa, L., Djedaini, M., Hoffman, R. Mitochondrial Role in Stemness and Differentiation of Hematopoietic Stem Cells. Stem Cells International. In press (2019). Genovese, P., et al. Targeted genome editing in human repopulating haematopoietic stem cells. Nature. 510, (7504), 235-240 (2014). Perdomo, J., Yan, F., Leung, H. H. L., Chong, B. H. Megakaryocyte Differentiation and Platelet Formation from Human Cord Blood-derived CD34+ Cells. Journal of Visualized Experiments. (130), e56420 (2017). Fares, I., et al. EPCR expression marks UM171-expanded CD34(+) cord blood stem cells. Blood. 129, (25), 3344-3351 (2017).